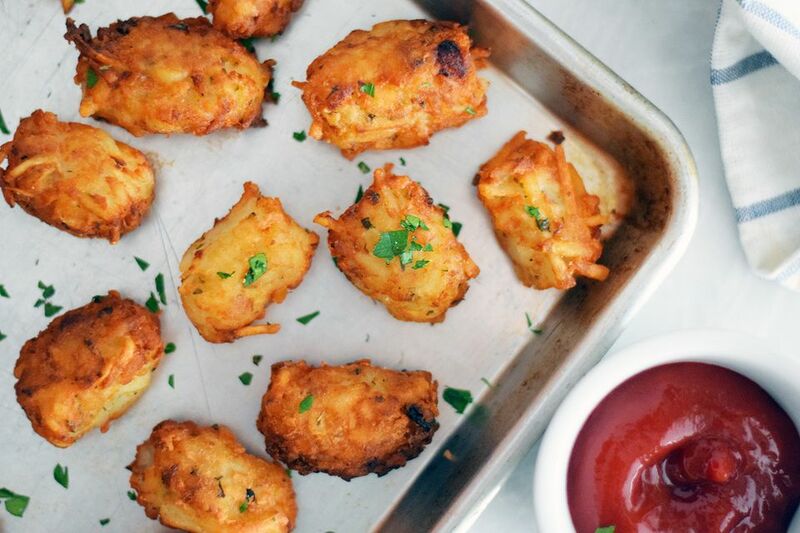 When it comes to tater tots, our first instinct is to hit up the supermarket frozen aisle, but it's actually quite easy to make them at home. While frozen tater tots are super easy to pop in the oven, most are full of processed ingredients. Homemade tater tots are incredibly delicious and, of course, a million times tastier than frozen ones. They're packed full of shredded potatoes, cheese, and spices, then pan-fried to a delicious crisp. Although the fried version is the tastiest, you can also bake them if you're looking for a lower-fat option. Using frozen hash browns is a nice shortcut to these golden-brown beauties, but you can also opt for fresh potatoes. The homemade version not only has great flavor, but all of your family and friends will be super impressed that you made them yourself. Completely thaw the frozen hash browns and squeeze them with paper towels or cheesecloth to remove any extra water. Chop the hash browns even more so the shreds are no bigger than a 1/2 inch. This will make it easier for them to form into the tater tot shape. In a large bowl, mix together the oregano, parsley, Parmesan cheese, flour, salt and pepper. Add in the grated onion, garlic, and thawed potatoes and mix until the spices are evenly distributed. Form tater tots by creating about 1-inch long cylinders. Flatten the ends with your thumb and forefinger to create the tater tot shape. Heat the oil to 375 F in a large heavy duty Dutch oven or other heavy bottomed pan. Fry 6 to 7 tater tots at a time, flipping them when one side gets browned, about 2 minutes per side. Remove them from the oil and allow them to drain on a paper towel lined baking sheet. Repeat with remaining tater tots until they are all fried. Serve immediately with chopped parsley and ketchup. If you want to use fresh potatoes, you will need about 4 pounds. Peel and parboil them for about 8 minutes. Allow them to cool slightly and grate them with a box grater. Then, follow the rest of the instructions. Do not let the potatoes sit out at room temperature after they have thawed for too long. Potatoes—especially fresh ones—can turn brown when they are exposed to air. If you want to bake the tots, put them in a a 425 F oven on a parchment paper lined baking sheet. Bake for 15 minutes, then flip the tots and bake for another 15 minutes until they are golden and crispy. These homemade tater tots are easy to freeze. Just place them on a parchment-lined baking sheet and allow them to cool to room temperature. Place the baking sheet in the freezer and chill for 2 to 3 hours. Then, pop them in a plastic freezer bag, label and keep frozen for up to 8 month. When you're ready to eat, bake at 425 F for 25 minutes. Mix in other cheeses like shredded cheddar or Monterey Jack. Add a 1/4 cup of either for cheesy tots. You can also add in a little onion powder or garlic powder for a little extra zing. Add a teaspoon of one or the other.